Super Smash Bros. Ultimate features every single Smash fighter in the series’ history, but apparently that wasn’t enough, as there are new characters being added in as well. One of the most exciting character reveals so far is that of Simon Belmont from Castlevania. He comes equipped with his signature whip, and was debuted in a truly awesome trailer. In this Super Smash Bros. Ultimate Simon Guide, we’ve got everything you need to know about the character, including Simon Belmont's moveset, alternative costumes, the reveal trailer, what his final smash will be, and more. After being top of countless Smash fans’ wishlists, Castlevania characters are confirmed to be coming to Super Smash Bros. Ultimate. Simon Belmont heads up the pack, bringing his whip and Holy water to the fight. We don’t know too much about the character as of yet, but we do know some of his moves, weapons and Final Smash. Let’s take a look at Simon in Super Smash Bros. Ultimate. 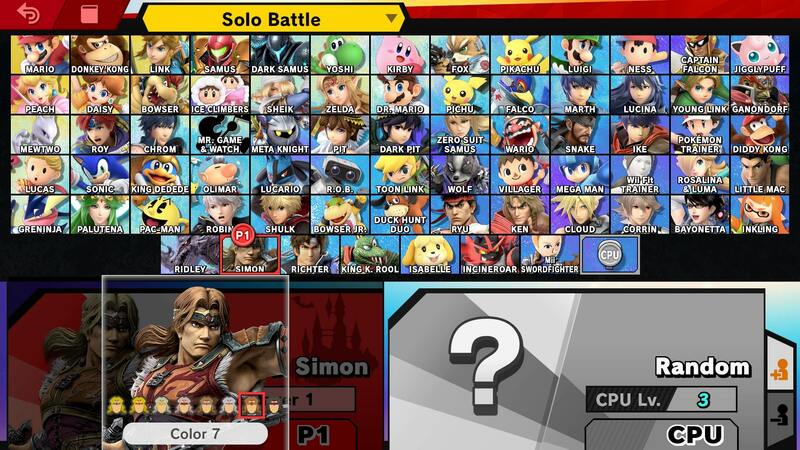 Simon is one of the new characters that Super Smash Bros. Ultimate adds to the series. He's a great fighter, able to easily punish at range. He has pretty poor recovery though, and if you're not careful you can be knocked out easily. To help you out, we've listed some essential Super Smash Bros. Ultimate Simon Tips for you to keep in mind. Simon has incredible range, especially with his Holy Cross. In the table below, you’ll find all the information you need to pull of every single move for Simon Belmont in Super Smash Bros. Ultimate. You’ll also be able to find information on Grand Cross, the name of Simon’s Final Smash move. We don’t yet know what Simon’s moveset will be exactly. We can take a look at the gameplay to work out most of it though, including some of the special attacks that will be available at launch. Here are all of the Super Smash Bros. Ultimate Simon Belmont moves we know about so far. Thanks to recently revealed gameplay, we know exactly what Simon Belmont’s final smash is. It’s called Grand Cross, and sees Simon trapping his opponent in a Coffin and chain whipping it into the sky. It’s a genuinely awesome move that causes the world around you to go full Castlevania, blood red skies and all. Here we have all of Simon Belmont's alternative costumes. These don't need unlocking, and can be picked when you choose your character. That’s everything we know about Simon Belmont in Super Smash Bros. Ultimate for now. You can head over to our Super Smash Bros Ultimate guide hub in the meantime for more general details on the game, like what the Ridley amiibo looks like, what stages are in the game, and more.